The annual publication helps students and recent graduates survive the real salon world. Pass it on. 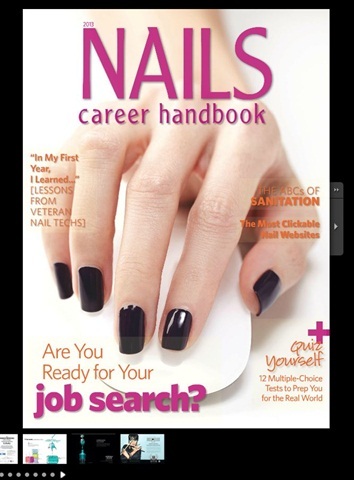 From the makers of NAILS Magazine comes the 2013 NAILS Career Handbook, a helpful guide for nail instructors to pass out to students and recent graduates. A perennial favorite, this annual magazine teaches fledgeling manicurists how to ace a job interview, fill their chair, steer clear of expensive state board fines, and so many other tips and guides on the real salon world. The 2013 digital edition, which is tablet friendly, is now available for free online. Please share this link with your classes to help get their job searches off to a strong start. You may even want to bring an iPad to school, so students can pass the issue around while waiting for clients at the salon or during breaks between lessons. A limited number of hard copies of the NAILS Career Handbook are available each year. While the 2013 Handbook is sold out, this is also the perfect time to sign up for the 2014 edition (plus other freebies!) via our Partners in Education program. The Partners in Education program also provides free subscriptions to NAILS Magazine for instructors and six-month subscriptions to students. Provide input on what you want in the 2014 NAILS Career Handbook to sree.roy[at]bobit.com. And remember to view and share the free digital version here.